elsita, smashing, kate durkin, berkley illustration, terry graziano, modica's Shop, tiny meat, phoebe1, chris parry, the black apple, Orange Willow, mary and jane. This is my latest in my fleet of cute little zombies. He is a corporate zombie. When I made my first two zombies I did not have the size hook that the pattern called for, so I had to use what I had. Mr. corporate was made with the correct sized hook, so he is a bit of a better size and shape. I think I found my new favorite thing to make, creepy cute little critters. They were a lot of fun to crochet, and I can wait to make a whole mess of them. They went together really fast, the hair is what took the longest. I have not decided what to use for eyes, but as soon as I know I will post photos. The patten is really pretty simple. This is the first "real" thing that I have crocheted from a pattern, other then granny squares so considering that I think I did a pretty good job. Stay tuned for more additions in my little army of the undead. Yesterday while running some errands I found the best book ever. 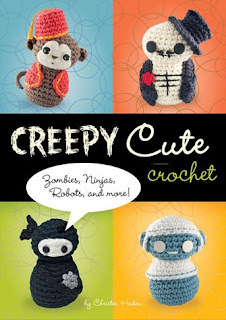 Creepy Cute Crochet: Zombies, Ninjas, Robots, and More! I Just learned to crochet last spring, and have not done a lot of it but because of this book I plan to do so much more. The little "dolls" are so great, can somebody say Fez Monkey... how much do I need one of those. Aside from the monkey, there are so many great projects like: the devil, nosferatu, a cleric, amazon woman, the corporate zombie, grim reaper, day of the dead gal and fellow, and many more! The best part about the patterns is that they all have the same basic body shape, so as soon as I master that I can make up as many characters as I want... FUN! The other day while browsing on crafster I came upon the greatest little bit of crocheted people a lot like the ones I hope to make a mess of. If you are a fan of the show Firefly you have to check these little guys out! Happy crocheting. 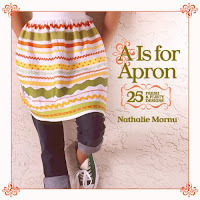 I ordered a wonderful book A is for Apron by Nathalie Morun and it finally came in the mail. It is such a great book, and I can't wait to start making the projects, they are ALL so cute. Reading this book made me remember how much I LOVE aprons. I swear I think I should have been a house wife in the 50s sometimes... And I think I will now have to work my hardest to bring the apron back. I would really recommend checking this book out, it has such great projects, techniques, and is really fun and easy to read. Also the illustrations and photos are very helpful and attractive. The book itself is also very well designed, which as a designer I love to see. They are finally done. Now I don't have to worry about whether or not I have pants on when I get up to make my coffee in the morning! I have had the material to make the drapes since just after I moved into the new house but have not gotten around to making them until now. They are super simple, 2 large rectangles with grommets at the top. The fabric I found and fell in love with to make the drapes with was only 55" wide, since my window is 75" I opted to add an extra 27.5" of fabric to either side to make each panel wider so the drapes would be more full. I do not plan to line the drapes with anything because the back side is almost as pretty as the front so I opted to do a french seam to hold these two pieces together, so there would not be any raw edges on the back side. I also tacked the seam down so that it would not pucker. After the two panels were all sewn together I put a 1" hem on all of the sides (not the top and bottom). I folded the fabric over twice and put a long strip of stabilizer between the two to make them a bit more sturdy. For the top and bottom I went with a larger 3" hem and used a heavier stabilizer, so that the grommets would not tear through. I put 4 curtain weights (2 on each side) on the bottom of each panel so that they would hang a bit better. Last I used 3/4" grommets at the top of the drapes. I placed the grommets about every 5 inches. I chose to use a curtain wire, as apposed to a rod which is why I was able to use such small grommets. All in all I think that my first drapes turned out pretty well. I did not do anything fancy, but I think their simplicity is what I like the best about them. I think that I might end up lining them after all. As much as I like the pattern on the back, the material is just a bit thinner then I would like an lets a bit to much in. Yes I do believe that their new album (the red album) might just become my new favorite. 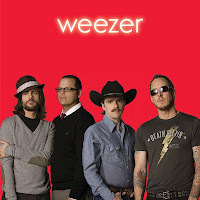 Now I thought that the blue album was and always would be the best, but I must say it that the red one might have to just edge out the blue for #1 in my mind. The video for "pork and beans" is great, if you are a frequenter of You Tube you may recognize some of the characters. Also they are on the cover of spin this month. I have not has a chance to read the article, but I LOVE the cover art, even if Rivers Cuomo has a creepy mustache. So whether you are a long time fan, or just like a good bit of great music you have to pick up the album, you will not regret it... it rocks!